As first step, I fired up IDA for initial analysis, so I would have general idea of the malware, then I started Ollydbg for dynamic analysis. 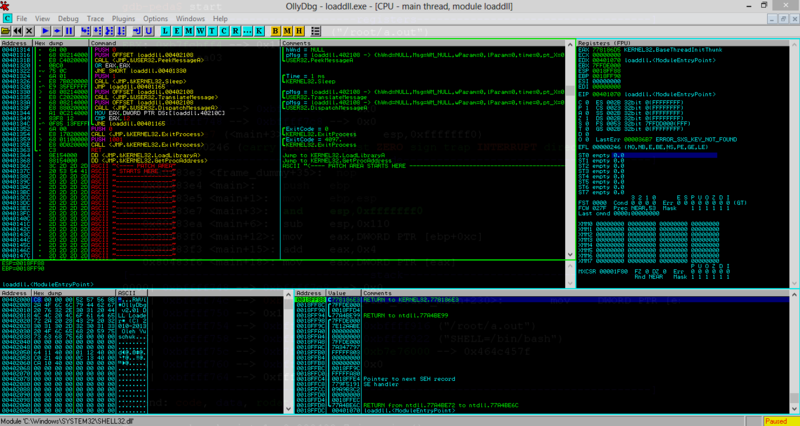 By the way, I've received several messages about use of Ollydbg, that why I use Ollydbg and not IDA's debugger. To be honest, in my own very personal opinion, IDA debugger is only good for operating systems Ollydbg doesn't work (MacOS, Linux, FreeBSD, etc. ), Ollydbg's ability to show string references in registers, very detailed memory map and memory pages, changing memory pages permissions or dumping or modifying them easily, breakpoint management, easy to navigate stack view, extended details in registers (when register hold an address to an API entry or a pointer to a string), Ollydbg's plugins, ease of use, being first tool that introduced me to reverse engineering world and using it since 2003, makes Ollydbg my primary tool for dynamic analysis in Windows, for rest of things (decompiling, other operating systems, graphs, patch analysis, bindiffing, static analysis, vulnerability research, etc.) IDA is perfect. Anyway, let's return to our main goal of analyzing FinFisher malware's main component. At first look, I've noticed that compilation date/time of this malware intentionally modified to hide real compilation date/time. It was set to 0xE6751A81 which means it compiled at 07/31/1983 08:58:39 PM, I don't know if this day have any special meaning, birthday of the developer maybe? Warmest July in Dutch history since 1852? LegalCopyright:     ©Firefox and Mozilla Developers, according to the MPL 1.1/GPL 2.0/LGPL 2.1 licenses, as applicable. LegalTrademarks:    Firefox is a Trademark of The Mozilla Foundation. Can Mozilla sue them for illegal use of their name in FinFisher malware? Anyway, after setting initial parameter, initializing security cookie, etc. first interesting thing in this malware was using EnumWindows API callback parameter to call a function. Basically it doesn't have anything to do with enumerating windows, but this API call acts as a sort of a small smoke screen. This call is located at 0x4020F1 and callback function is located at 0x00401C1B. - Intentionally causes crash by three UD2 opcodes which is sort of "throw exception" in assembly. There is UD0, UD1 and UD2 which means "Undefined behavior" or "Undefined instruction". Naturally this exception will need an exception handler, as result, KiUserExceptionDispatcher will be called. As KiUserExceptionDispatcher is already modified, it will redirect program's flow to a new location using this exception and exception handler trick. Exception handler code just puts ESP value into EAX and then calls 0x00403489. This function, calls NtContinue API from ntdll.dll to let program continue as it was before exception. I think this whole trick was to bypass some sandboxes and mostly heuristic engines, as they'll imagine that the application has crashed three times. After patching and triggering exceptions 3 times, it calls 0x00403447 function, which reverses the patched bytes from original values stored into stack and even restores the permission to PAGE_EXECTURE_READ for first 16 bytes. It returns everything to it's original like nothing ever happened to KiUserExceptionDispatcher. After these tests, it calls 0x004014F4 function to determine if the OS is 64-bit, if so, it creates a new x64 malware in %TEMP% folder. This x64 bit application does have same version info and compilation date of it shows it will be compiled in future: 07/25/2022 09:18:21 AM. So I think they modified these values randomly just to hide real compilation date/time. So if OS is x64, it just creates new 64-bit malware, executes it using CreateProcess API and terminates itself. The driver would need an additional post for analysis, but generally speaking, it does two things, one of them is receiving name of an object to get attached devices to this object and detaching them. For example if you pass tcpip.sys to this function, if a firewall device is attached to tcpip.sys, it will try to detach it, so software firewall won't work anymore. Also it does have another function for just opening file from kernel and passing the handle. Here is the interesting part, it checks loaded drivers and loaded processes for "cmdguard.sys" and "cfp.exe" to determine if Comodo Firewall is running or not and then it checks for "klif.sys" and "avp.exe" to see if Kaspersky Internet Security is running and it doesn't care about any other anti-virus or firewall solution. So if AV solutions doesn't exists it will open already running explorer.exe, duplicate tokens, inject code in it and run injected code from explorer.exe, but if one of these solutions exists in your computer, it will call sub_4A3816D2 which basically, calls GetWindowsDirectory, appends explorer.exe to it, creates a suspended process with explorer.exe as commandline argument. As next step, it calls GetCurrentProcess, duplicates the handle for current process using DuplicateHandle API, calls VirtualAllocEx to allocate 0xEE (238) bytes in it. Finally it calls WriteProcessMemory and ResumeThread to continue execution. In a nutshell, if Kaspersky AV or Comodo Firewall exists, it won't inject code into already existing explorer, instead it will create a new explorer.exe as suspended process, inject code in it and continue execution. The msvcr90.dll is an encrypted and packed DLL file. It never writes decrypted and ready to use DLL file into disk, it uses CreateFileMapping and MapViewOfFile APIs to load the encrypted file into memory, then decrypts it on memory and executes it. I have dumped the decrypted DLL with all IAT entries fixed properly. My DLL MD5 is 3AAF1242246A2F3443CD9125C3280F06. This is the main DLL, it does everything with the help of other modules, this DLL does also have it's own set of modules and resources. For instance, this DLL does have 3 resource entries, first resource entry is another DLL embedded inside it. This embedded DLL does have (presumably) an un-altered compilation date/time information. This one is compiled at 10/28/2010 11:56:39 AM. The embedded DLL does have 1 exported function which does nothing. It uses global variables to receive parameters such as host and port and IP and it does act as an internet proxy, so when this DLL injected into e.g. svchost.exe, all sent and received data will be through this process and it will appear so in firewall logs. This DLL is just 11264 bytes specially designed for this purpose. When this tiny DLL loaded, it creates an event with "WininetProxyExit" string. Then it creates a mutex called "WininetProxyMutex". Finally it creates two threads, one for socket operations and the other one is a watchdog for socket thread (to keep DLL alive). That's all about this tiny DLL. which as I said before, shell32.dll is an injector with special features for msvcr90.dll. So in next post, I'll try to analyze last remained components: 64-bit malware, msvcr90.dll and the driver. Came across this when i googled the 4 byte xor key. Same malware you think? Yes, Mozilla can sue Gamma. Thanks for letting us know about it, honestly when I was talking about suing, I was sort of joking, but it seems it happened and it is serious and could happen again if we find evidence that they used it after April 2013, but I don't think malware samples I had would fit this category, we need more samples to analyze. Thank you Jacob for great suggestions and I am happy to hear that you liked the article. I will definitely use the theme you provided from now on. This simple plugin allows saving the loaded executable labels and comments to a CSV file and later loading them back in. You can store, share, modify and merge your notes with ease and never lose your notes because OllyDbg flipped and threw them all out (it can happen). I will definitely keep them in mind, thanks for helpful comments, I am sure visitors will appreciate it too. The driver changes the MBR. so get your bochs ready :). "MD5 of driver file is: DB5BD1054B4FE763FAAC049B72DA2EB6. It seems no one analyzed it as Google search yields no result." Maybe it´s late, but since, as you said, the driver writes a random installer path, wouldn´t the MD5 hash be different on every system for the driver? All in all, great article, thank you!